· How Can You Help ? The Bethesda Foundation helps in the following many ways. The Day Care Centre was built in 1999 and acts as a drop-in centre for children from the streets and from poor families. Around 30 - 40 children attend each day. There are facilities to wash clothes, shower and there is always a hot meal and a change of clothes available. During school terms the centre is used as a base from which the children attend school and they are helped with their homework by workers. Medical care is also made available for the children. During holiday periods the children are kept busy during the day with arts and crafts, organised games and playing with toys. They are encouraged to help themselves as much as possible. Some time is also set aside each day to teach the children about Jesus and God's Love. They are also taught songs and how to pray. The Boy's Home was built in 1998 as a home for boys from the streets in Galati who have little or no hope of return to their own families. It has beds and facilities for up to 30 boys. The aim of the house is to provide a home for the boys in a safe and secure family environment. The boys attend school, do their homework, eat, sleep and live here. They learn personal hygiene and relating to others in a caring way. The boys all have their daily chores (helping to keep the home clean and tidy) and some also help with the work on the farm. They are brought up in a Christian family environment. They are encouraged to read the Bible together, pray and to develop their young Christian minds. Slowly and gently the boys realise God's love for them and begin to feel part of a family again. The lives of these children have been completely transformed from their earlier existence. As in any family, the boys are encouraged to develop their talents so that they are able to become independent and support themselves. Some boys who have recently left the home now are in full time employment in the city and others in work connected to Bethesda such as in the kitchens and on the farm. Others are in training to become maintenance men, mechanics, drivers and office workers for the Foundation. The ‘Girl's flat' from which they moved at Christmas 2003 is now being used as a ‘half – way' home for older boys from the Boys Hostel as they leave, working towards their independence. They are helped to learn budgeting and self-sufficiency as they go into employment locally. The farm is located at the rear of the Boys Home on approximately 3 acres of land which is managed by a local Romanian farmer. (ii) to produce food for the Bethesda projects with a view to being as self-sufficient as possible. There are two part-time farm workers, one of whom is an older boy who still lives in the hostel. The farm generally comprises of animals - cows (for milk and cheese), pigs (for home curing and rearing piglets), hens (for eggs and for the table) and rabbits. There are also bee hives(for honey). An orchard with plum, peach & apple trees provides fruit, and vegetables are also grown for their own use. A new development recently is the purchase of 25 acres (10 hectares) of land just outside Galati to cultivate wheat which will be used for bread making. The workers hope to install 2 large ovens for baking and this will provide both employment and food for the Foundation's work. Bread forms a very large part of the food requirement. They use up to 100 loaves of bread a day in their projects so this will be a great help to them. This is the girls' house on the left. 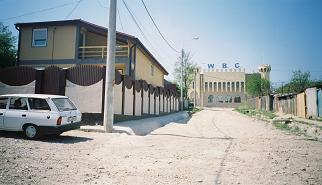 The WBC building is the head quarters of a security firm which all adds to the safety of the position and property. Opposite the house out of the picture in the bottom left hand side is the Day Care Centre which gives extra confidence for all. Just before Christmas 2003 the Girls moved to a new timber framed house, which has been built on a site next to the Day Care Centre during the summer of 2002. The new accommodation provides greater security and better facilities for them. The rooms are fitted out beautifully with timber from Germany – a gift and personalised buy the girls who use them; there is a guest room and a yard in which they can play. The whole house is surrounded by a fence and a security system is in place. The girls have a "mama" who lives with them and cares for them overnight, and the care workers come in on some evenings to cook their meals and occupy the girls in order to give the "mama" some relief. Each girl goes to school and they work hard to catch up their education and work towards their adult independence. These girls have been abused and neglected and the aim of the home is to give them protection from further mistreatment and give them back their childhood years, and a future in which they can mature and become independent. A picture of the orchard where the campsite will be located. A very large beautiful orchard site in the mountains beside a river became available for sale and has been bought by the Foundation to be used as a holiday site for the children. The harvest produce of hard and soft fruit will be used for food and trade, and the grass will be used for fodder on the farm during the severe winter weather. This is their next big project! The children from the homes as well as the city and streets are brought for week long breaks away from the smoke laden city and greatly benefit from the fun, fresh air and good food.